Here is a pickup which answers a very frequently asked question: how to have a vintage style PAF sound with a slightly higher output level. It is a warm and very dynamic pickup, it answers every attack by taking into account accents and nuances. It gives the guitarist a very wide range of sounds by simply using its volume and modulating its attacks. For a long time Patrick used a tonezone but for the project with Hervé N'Kaoua he needed a more precise sound, with added clarity (brightness) and respect of the nuances. 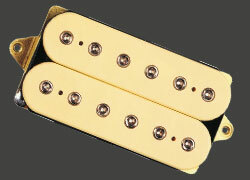 He has since installed this pickup on all of his guitars including the PRM. Okay, we admit it's a strange name for a pickup that's not a megavoltage monster, but try it in the bridge position with a really bright amp and you'll get it. What we really wanted was a super clean neck pickup, because we've heard years of complaints about muddy-sounding humbuckers. This pickup is the cure. With some guitar/amp combinations it can sound almost acoustic. With others, it's real Strat-like. Aside from canceling the 60-cycle hum, it bears very little resemblance to a standard humbucking sound. 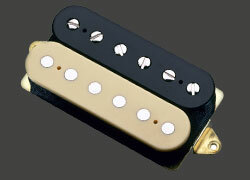 Patrick looked for a pickup in the middle road between single coil and humbucker. His choice is this pickup. For several years Patrick has exclusively used Dimarzio cables for speakers , pedals and guitars.